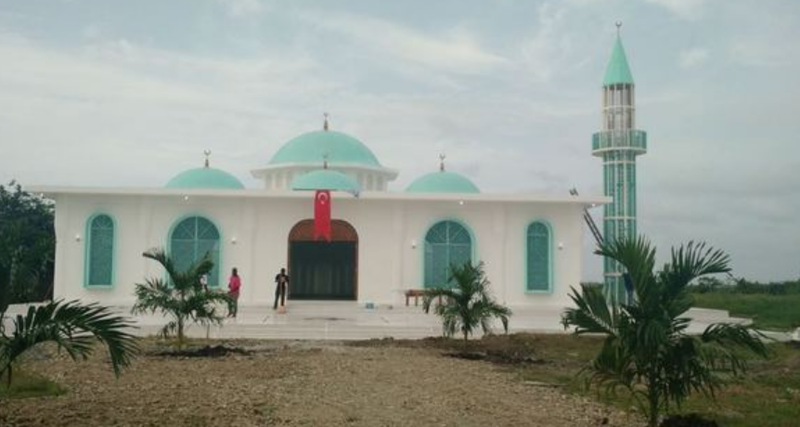 As Abreu Report wrote this past March, Islamic influence in Haiti has been growing at a geometric rate, with Turkish media reporting that the first mosque with a minaret and school has just opened in in the Caribbean country, to serve 5,000 of the nation's Muslims, who constitute the fastest-growing minority. After the 2010 earthquake which devastated what little infrastructure Haiti had, money from Islamic nations began flowing into the island, with the supposed goal of aiding with reconstruction. Most of the money has gone into expanding the influence of moderate Islamic charities, but just across the pond from Haiti, in Jamaica, a pernicious influence brews that threatens to skip across the pond and disrupt the lives of the 20-plus million inhabitants of the island of Hispaniola. Sheikh el-Faisal, a hardline Salafist who has been deported from the United Kingdom and from Botswana due to advocating for the use of chemical weapons against unbelievers, is now in the Caribbean, preaching hate on a regular basis and threatening doom against the Dominican Republic, a nation of "American-allied infidels" he believes have denied their Africanness and Muslim/Berber roots. As the Muslim influence in Haiti continues growing, so does the influence of Sheik el-Faisal, who already has a substantial following there due to the absence of a state apparatus to track radicalization in the population. It would be naive to presume that the Dominican government, led by the populist Danilo Medina, is not fully aware of the situation. In fact, this summer will truly tell the world if Haiti's fate is to be inundated with more than 130,000 disgruntled individuals who have never lived in the country -- as the Dominican government prepares to enforce some of the world's toughest immigration laws -- in an inundation which will undoubtedly lead to the rise of radical anti-Dominican sentiment. Among these "Haitian" deportees will be Dominican government agents, and their job will be to stoke tension in order to further globalist objectives, as President Medina rose to power by first traveling to Washington, where he made promises to the National Security Council. Although it was a 2013 decision by a top court in the Dominican Republic that led to the stripping of residency rights for the descendants of undocumented Haitian migrants born on Dominican soil, Mr. Medina simply does not have enough power in the face of the United States to conduct the mass deportations that he is about to undertake... he has the explicit approval of the United States, and does not have his "hand forced by a court" as he proclaims in the international arena. Although July brings Independence Day in the United States, it shall this month be Deportation Day in the Dominican Republic, as 137,000 people who have known nothing but the Dominican Republic suddenly wake up and realize that they have to travel across a border where radicalization and strife awaits them. Losing one's identity is a traumatic experience which can often lead a population to develop suicidal ideation, and this will be the case in the parallel society of Spanish speakers which will now be created within Haiti. The United States and the Dominican Republic are wealthy enough to lift Haiti out of its status as a failed state, but this would interfere with the Islamization objectives which Washington has now laid bare, and it would interfere with the Dominican government's plans to send 137,000 disgruntled individuals into a foreign land where they will be expected to reforge their identities, predictably in an anti-Dominican, anti-Christian way.